Located on the Inner Harbor of Baltimore, Maryland, the Baltimore World Trade Center is the world's tallest equilateral five-sided building (the five-sided JPMorgan Chase Tower in Houston, Texas is taller, but has unequal sides). It was designed by the firm of the famous architect I.M. Pei, with the principal architects being Henry Cobb and Pershing Wong. The building was completed in 1977 at a cost of $22 million. 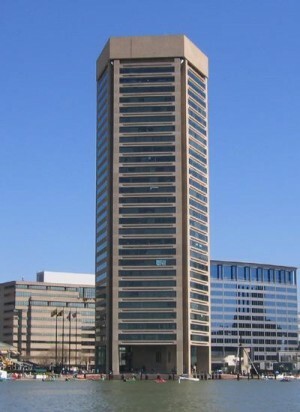 The building was positioned so that a corner points out towards the waters of the Inner Harbor, suggesting the prow of a ship. Perched at the Harbor's edge, the building appears to rise out of the water when viewed from certain vantage points. Giant floodlights in the base of each of the Center's five recessed corners can dramatically illuminate the building at night from the ground up, with oversized parabolic mirrors at the top of the five corners then reflecting the light outward in brilliant V-shaped beams. The "beacon" effect was loosely inspired by lighthouses found along the Chesapeake Bay.